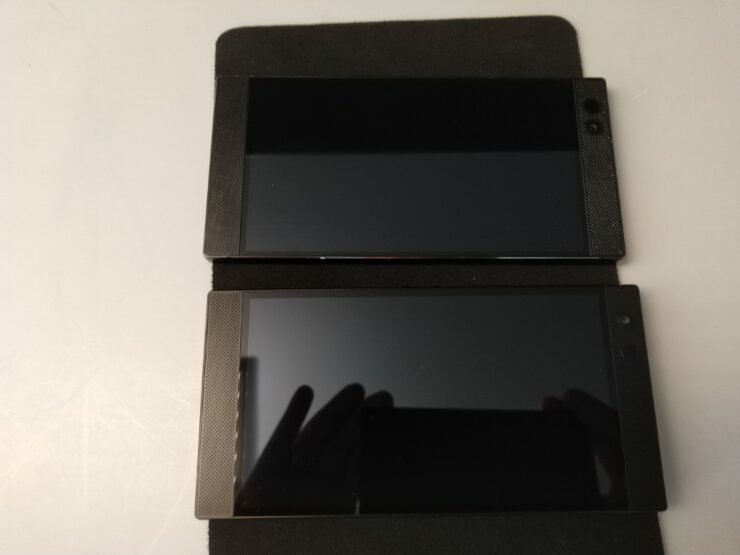 A little over a month ago, I brought you what turned out to be an exclusive story with the Razer Phone 2 officially breaking cover. 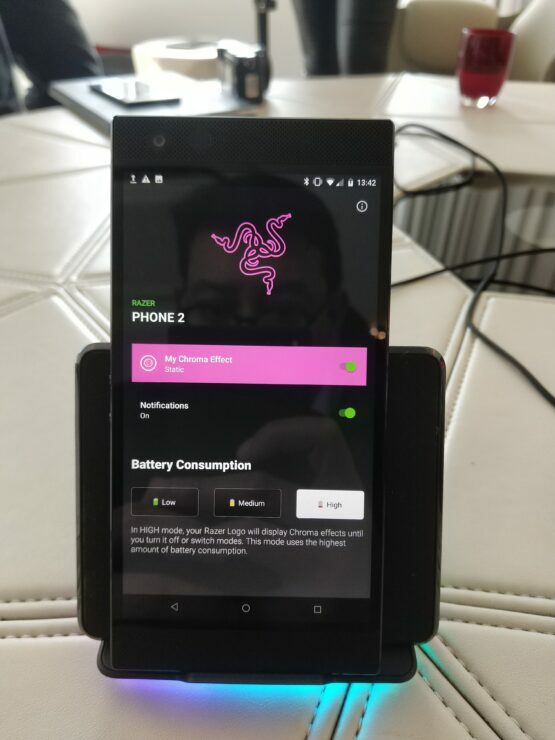 From my perspective, I was reporting on Razer’s half year earnings and just highlighted a couple of points in the product roadmap to look forward to, not realising that Razer hadn’t officially confirmed the second iteration of its gaming phone yet, imagine my surprise then when my article was cited across the web as the official confirmation that the Razer Phone 2 was coming! 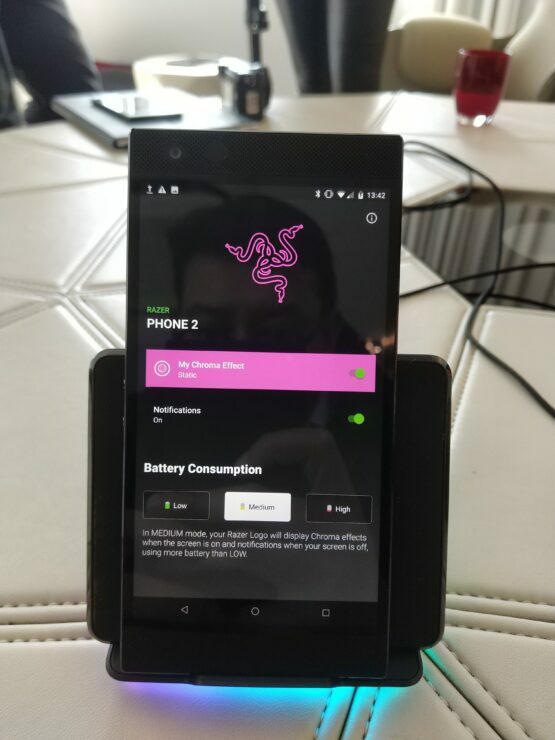 Well today, we have the news that the Razer Phone 2 has now launched officially! I’ve been using the mark 1 as my daily driver since I got one to review last year and can honestly say it’s been an excellent experience. It was so good I gave it an Editors’ Choice Award when I reviewed it (here). 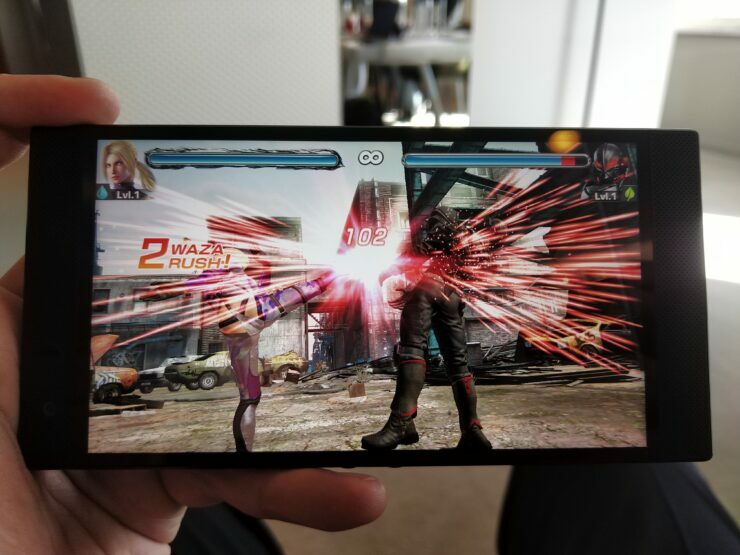 Gaming on a phone is still… gaming on a phone, but for me the original moved the dial forward on the overall phone experience I could expect including the fabulous 120 Hz screen and the best speakers bar none on a phone. Couple that with a 4,000 mAh battery for all day running, a generous 8GB of memory and 64GB of storage and Razer was onto a winner. 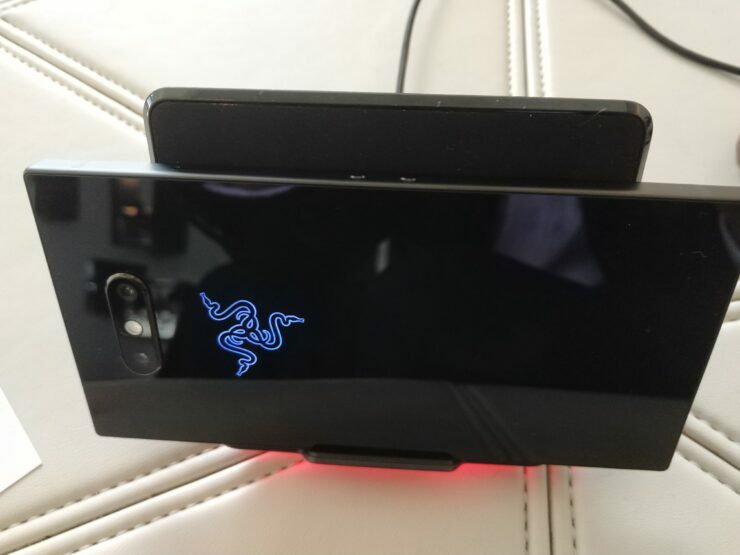 Small let-downs were the lack of a headphone jack, no wireless charging, a screen which over the course of the last year experienced some small discolouration on the left hand edge and a fairly basic camera app but for a first attempt, Razer had certainly got what it needed to get right. Since then, we have seen other attempts at “gamer phones”, notably the Asus Rog Phone. Perhaps a slightly more extreme looking phone, particularly with its odd-looking bolt on cooling solution and array of accessories, but today is all about the second version of the phone that started the “gaming phone” trend, so what do we have? First things first, like many companies these days, Razer has gone for what looks to be an every other year cadence (or maybe even longer!) on a significant redesign. 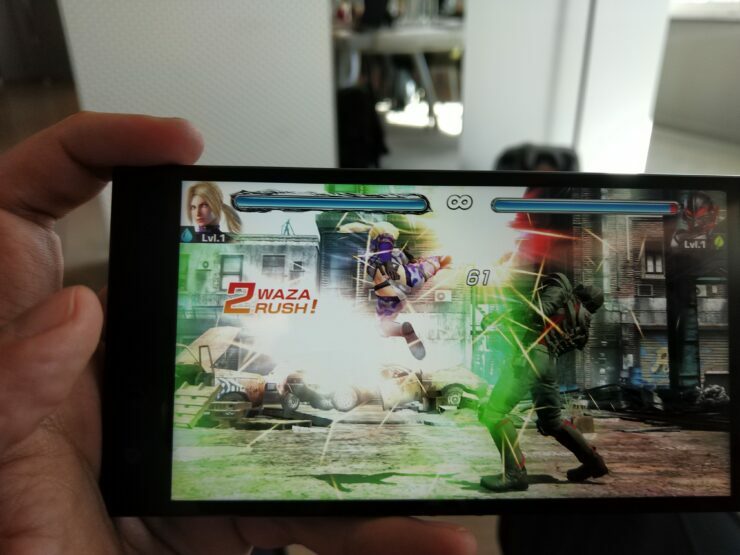 The Razer Phone 2 is very much of the “if it ain’t broke, don’t fix it” school of thought and at first glance is indistinguishable from its predecessor. Ultimately if looking at the nitty gritty, it has grown ever so slightly with dimensions coming in at 158.5 mm x 78.99 mm x 8.5 mm vs 158.5 x 77.7 x 8 for the mark 1. One change on the front addresses a small grumble I had with the mark 1, namely that if you’re someone who tilts their phone anticlockwise to go landscape like I do, your left thumb will cover the sensor which means the automatic screen dimming will kick in. 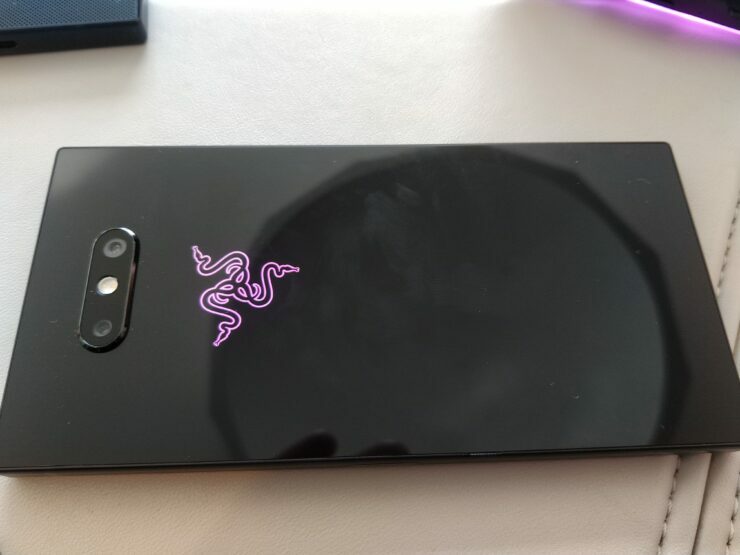 Significant changes then aren’t on the front side of the phone, however on the back and under the hood, things are a different story with a Gorilla Glass 5 now gracing the back of the phone (along with the front), along with a Razer Chroma logo with full 16.8m colours and the usual array of effects Razer fans will be used to. The Chroma logo also can be used for notifications and has various settings to conserve power or have it on all the time etc. 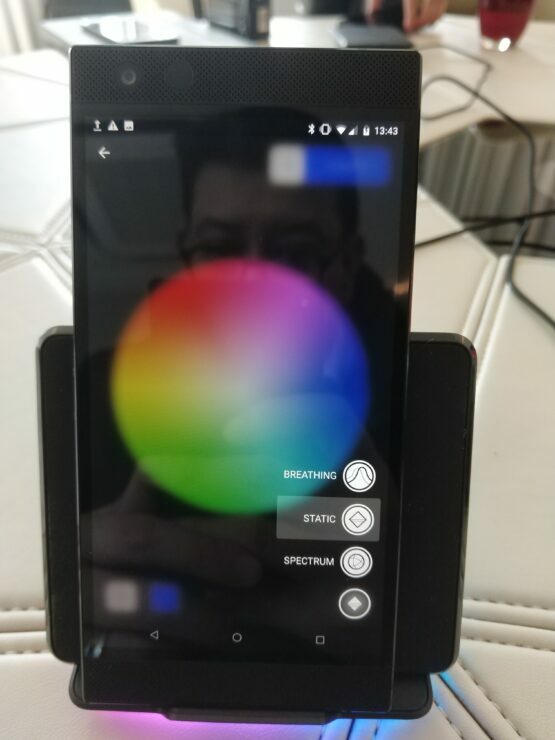 The cameras on the back move down and to the centre, equidistant between the now Chroma logo and the top edge of the phone. Other than these small visual cues, you’d be forgiven for thinking that a Razer Phone 2 was a Razer Phone. Inside, the changes continue with the mark 2 now coming with IP 67 water resistance (without seals of course) meaning that the phone can theoretically be submerged in water up to a maximum of a metre deep for half an hour. Do keep in mind however that IP dust and water ratings are looking at very strictly controlled lab environments with distilled water and controlled pressure. Realistically, we don’t expect people to take the phone swimming however and it’s more to ensure that everything keeps working in the event of an accidental splashing/dropping into liquid incident. 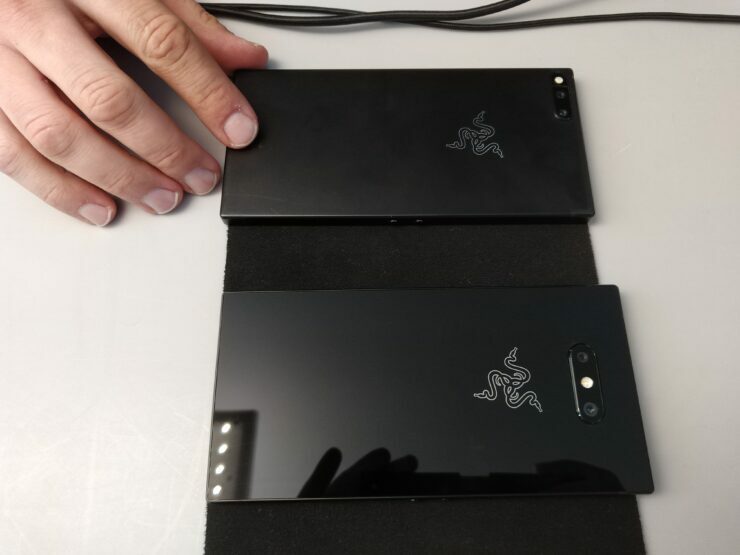 Still, it’s nice to see that Razer has seen fit to add it to the mark 2 and managed to do so without significantly increasing the footprint of the phone. Other major changes are the obviously expected upgrade to a Qualcomm Snapdragon 845 chip clocked at 2.8GHz (the maximum Qualcomm recommends), vapour chamber cooling vs the heat pipes in the mark 1, a 50% brighter screen (645 nits), optical stabilised Sony IMX camera sensors, 10 bit colour accuracy, Gigabit LTE for 20% faster connectivity (where supported) at up to 1.2Gbps, Qi wireless charging and Quick Charge 4+, along with a stronger vibration motor. Android 8.1 will be shipping with the Razer Phone 2. Dual sim or sim and micro SD up to 2TB are the order of the day for signal and additional storage. The camera will also have a panorama mode this time we’re assured, as well as better overall functionality compared to the somewhat Spartan app on the mark 1. 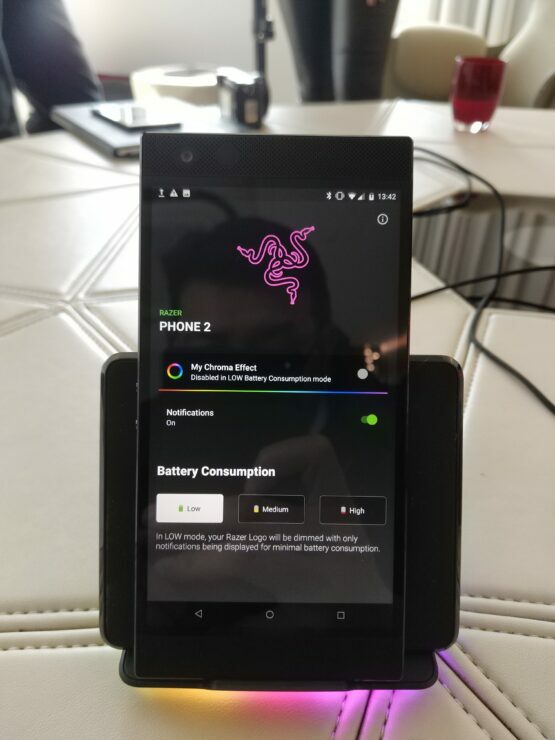 Perhaps unsurprisingly, given that the phone now supports wireless charging, Razer will be offering an optional wireless charging dock for sale which also has (you guessed it!) Chroma on the base. 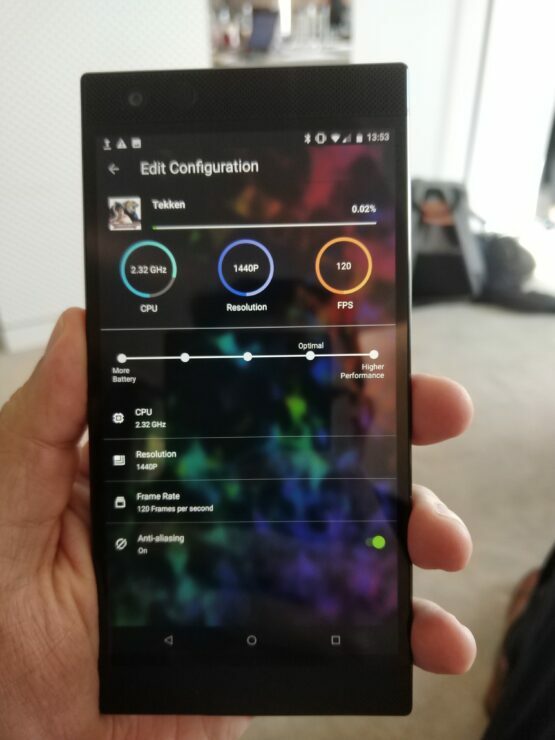 Unchanged specs are the 120Hz screen, 8GB of memory and 64GB of storage, STILL no headphone jack but a 24 bit THX DAC, Dolby Atmos and Nova Launcher. Launch prices will come in at $799, £779 and €849. Razer had a good launch with its first phone. Strong competition in the phone space is naturally a given and our reversing of the numbers from their earnings report (read more about that here) gave us a rough estimate at about 20,000 phones sold which Razer caveated in their earnings statement by saying that the first version was launched in a limited run. It will be interesting to see how the second generation of the original gamer phone does. Certainly it will be facing an uphill slog to attempt to dislodge the dominant players but it feels likely that there is a decent market out there for this kind of product. We’ll be reviewing the phone soon so keep an eye out for that and will no doubt attempt to reverse engineer sales numbers from future earnings reports again. It will be interesting to see how the business line evolves. 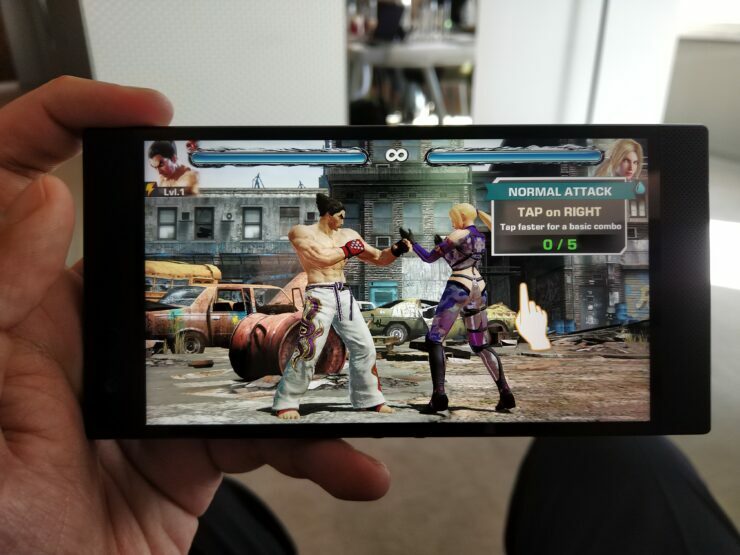 Having a play with the phone, it feels very much like the mark 1, sound continues to be excellent, the screen is still the best screen bar none I’ve seen in a phone and under load while playing Tekken with the 845 turned up to 2.8GHz (still customisable from the Razer Cortex app), the phone gets mildly warm but not overly hot. 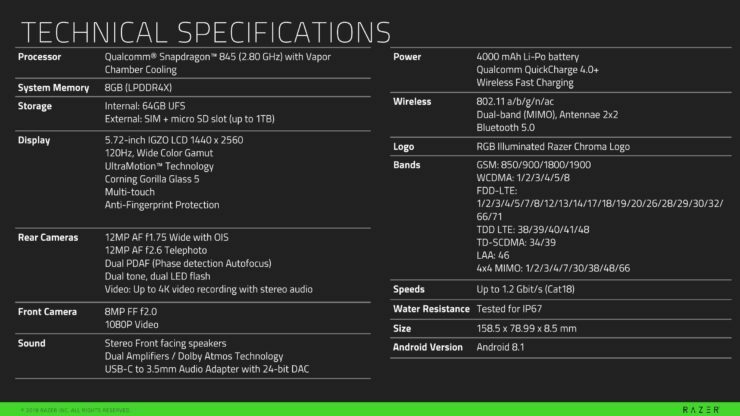 It would appear that Razer is leaving it to others such as Asus to chase clock speeds (the Rog Phone clocks in at 2.9GHz with a vapour chamber but it’s likely that bolt-on external fan is needed for a reason…) and building what it thinks is the best phone a gamer can buy but which is also usable as a daily driver in a variety of settings, be it having lunch with school friends or sitting in a boardroom. I only wonder what kind of case they’ll launch. That Chroma logo on the back deserves to be left uncovered! I suspect a cut out will be in order.